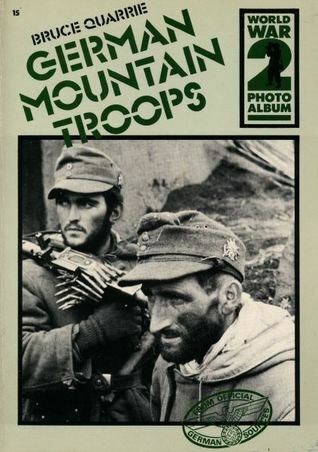 The author tries to set a light tone, even with a touch of humour, portraying these mountain troupes almost as a sort of extreme sport enthusiasts or people with a hard job that someone’s got to do… However, I came to this book after reading about the track record of the seventh division in the Balkan campaigns (anti-guerilla operations with abundance of violence directed at civilians, their property, captured prisoners and wounded), so this approach does not sit well with me. The book seems to be aimed at modellers, so it contains bare minimum of historical context, practically no maps or details on operations and very little technical data. But it does contain many high quality photographs. It is obvious that these troupes had very specialized training and likewise specialized equipment for difficult mountainous terrain. By some accounts of the Yugoslav partisans that I read, they (partisans) were impressed (or better said horrified) to see that these German mountain troops hiked the highest peaks of the Durmitor mountain (one of the highest and most rugged in Montenegro) during the offensive, and that they also got some heavy equipment up there (like mortars, submachine-guns, etc). All of this makes the fact that they were obstructed in their goals, outmanoeuvred and even defeated all the more impressive….